Contrary to general perception, developing apps is an extremely challenging and time-consuming task. Right from ideation to design and even further, everything should be picture-perfect to match the expectations of target customers or clients. Many businesses now leverage the power of these apps as people are accustomed to using devices loaded with user-friendly apps for news, entertainment, sales offers, ticket bookings, and so on. Also, these apps help businesses to ensure a wider reach without spending a fortune. In such a scenario for many, an SDK proves to be a boon because it promises to offer more value to a business. Accura Technolabs, a Singapore based R & D company acknowledges this fact and offers Accura SDK. One can use it to integrate Accurascan with existing apps. Accurascan is a mobile OCR app that enables quick scanning of an array of documents in an offline mode. One of the biggest benefits of the Accura SDK is that it aids in easy and quick customization of the Accurascan app. This means branding is possible in a hassle-free manner and businesses can also enhance its features to make the Accurascan app more apt for their specific business needs. For example, a tour and travel agency can download the OCR mobile scanning app and can then acquire the SDK to customize the app powered by the Accurascan engine. The agency can then ensure client satisfaction by fast scanning of visas, ID cards, passports, and even more within a fraction of a second. This proves handy as the Accurascan app can scan documents for a large number of countries including Middle-eastern and European countries, as well as, India, UK, and others. Accura SDK is available for both mobile and web platforms. While for Android and iOS, it requires 4.4 and later version and 8.x and later version respectively, it has compatibility with Linux and Windows platforms too. Thus, with the help of the Accura SDK, users can also make use of the powerful Accurascan app on a web platform. For many businesses where more than mobile devices, scanning solutions are needed at a particular workspace like a desk at the front office of a hotel, it is more convenient to use a passport reader in an online mode to easily save scanned details in a database. 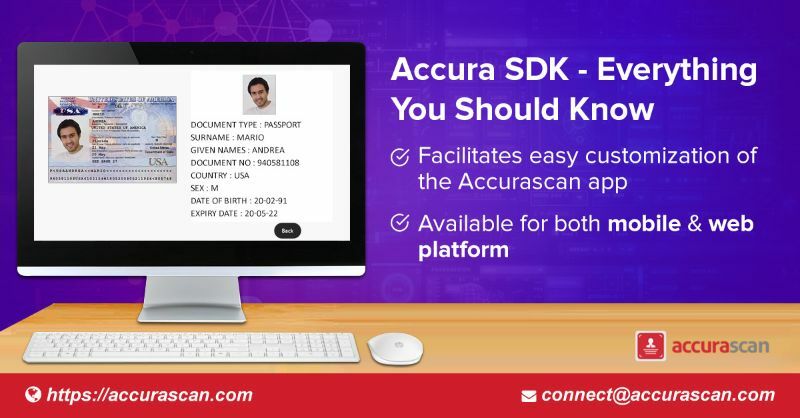 So, if you have a requirement for an inexpensive and fast scanning solution, download the demo version of the Accurascan app and then acquire the Accura SDK to make the most of it to suit your business needs.The app’s demo version is readily available for a free download at Google play store and the App store. To experience more convenience, you can also opt to choose AccuraGo- a ready-to-use SaaS-based scanning solution offered by Accura Technolabs.